I picked up some bad habits lately: running over pedestrians for their pocket money, incinerating enemy gangsters with Molotov cocktails, and blowing up cops with a rocket launcher. But starting my own chop shop has sharpened my business skills, and you should see my chiseled biceps. “Grand Theft Auto: San Andreas,” and earlier installments of the popular series of carjacking games, outrage parents and politicians because they nurture every evil impulse you’ve ever (or never) had. CJ, the player character, starts the game as a low-ranking, little-respected member of the Grove Street Gang. 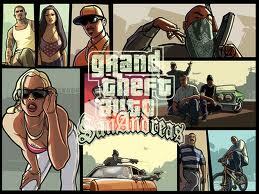 He grows in stature by completing missions in San Andreas, a thinly-veiled parody of California. Early missions are easy and fairly bloodless, like tagging churches and burglarizing homes. Later CJ graduates to greater and gorier challenges, like stealing a harvesting combine from a survivalist camp, and grinding the survivalists through the combine during his escape, before delivering the machine to a marijuana farmer. Previous “Grand Theft Auto” games let players hire prostitutes to gain extra health points. “San Andreas” lets you make extra money by pimping the prostitutes yourself. Video games that glorify prostitution, gangs and realistic violence can’t be good for the young or young-at-heart. But since we’re all playing anyway, it’s nice that “San Andreas” has some redeeming qualities. In fact, it imparts several pieces of healthy and practical advice. For example, CJ actually has to exercise and eat well to stay fit. To complete certain missions, he must build his strength by working out in a gym and swimming. He also becomes fat if he eats too much pizza and fried chicken; it’s better to order a salad. Players get the benefit of these valuable real-life lessons for only a few dozen hours of sedentary television gazing and a mild case of carpal tunnel syndrome. In addition, the game offers relationship tips when CJ dates his girlfriends: a progress meter rewards him for giving them flowers and penalizes him for trying to kiss them too soon. Never mind that Denise wants to perform drive-by shootings on every date, and Catalina considers armed robbery to be sexual foreplay. CJ participates in countless criminal schemes, but he draws the line at crack cocaine. In fact, he gains respect from other gang members by beating a crack dealer to death and later by destroying a crack factory with a car bomb. CJ also learns about fashion (by wearing gang colors), vocational skills (by robbing banks, trains, military bases and casinos), social justice (by planting drugs in a corrupt prosecutor’s car) and career networking (when he earns enough respect points, he can command other gang members in turf wars). Maybe these points are small consolation, but they will have to do, because “San Andreas” and its like are not going away. This teacher can verify that kids had the game within nanoseconds of its release. “Mature” rated games scare them off about as much as rated R movies.